The black-bellied whistling-duck (Dendrocygna autumnalis), aka black-bellied tree duck, belongs to the family of ducks, geese and swans, the Anatidae. The whistling-duck is distributed in southern regions of North America and central and northern parts of South America. These bird species are partially migratory. These ducks are polytypic species. The black-bellied whistling-duck (Dendrocygna autumnalis) is a medium-sized duck, measuring 40 to 55 cm in length and weighing 500 to 1000 grams. The female birds are slightly larger. The wingspan is 75 to 95 cm. 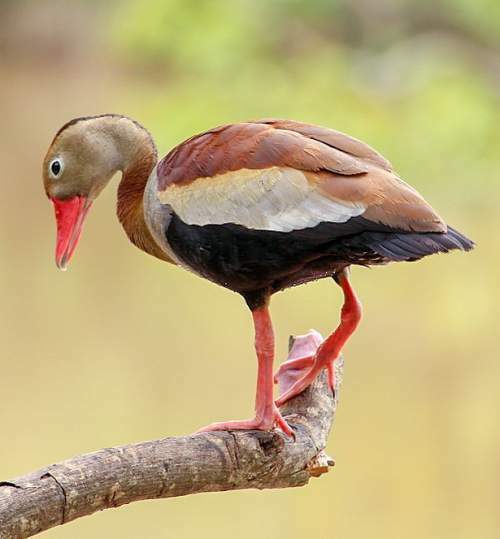 The black-bellied whistling-duck has chestnut brown central crown, hindneck, lower throat, breast, upper belly, neck and back. The lower belly region, undertail and the uppertail are blackish. The face and upper neck are grayish. The bill is long and pinkish red. The irises are brownish. There is a white eye-ring. The legs and feet are pinkish. The duck call is a whistling "chee-chee" or "waa-chooo" sound. 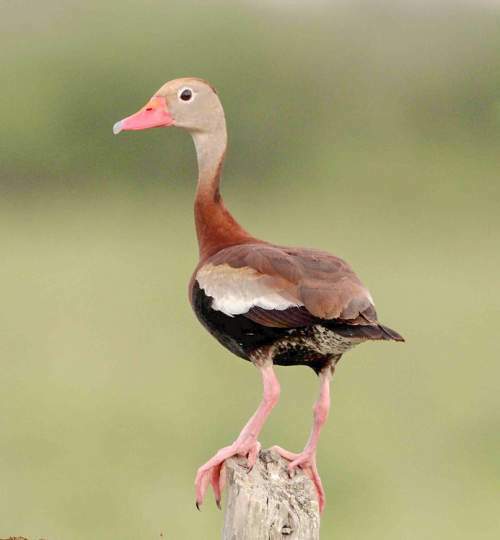 The black-bellied whistling-duck subspecies D. a. fulgens is distributed in Southern USA, Mexico, Belize, Guatemala, Honduras, El Salvador, Nicaragua, Costa Rica and central and northern Panama. The subspecies D. a. autumnalis is distributed in central and south Panama, Colombia, Ecuador, Peru, Argentina, Paraguay, Brazil, Venezuela, Surinam, Guyana, French Guinea and Trinidad and Tobago. Vagrant populations of these black-bellied whistling-duck species occur in Bahamas, Chile, Grenada, Jamaica, Virgin Islands (USA), Cayman Islands (UK) and Gambia. The Important Bird and Biodiversity Areas (IBA) of these black-bellied whistling-duck species in Mexico are, Humedales de Alvarado and The Encrucijada. The IBA in Nicaragua is Tisma Lagoon. The IBA of these black-bellied whistling-ducks in Belize are, Rio Bravo CMA Gallon Jug Estate, Northeastern Belize, Crooked Tree and associated wetlands and Belize Coastal and near shore islands. The IBA in Colombia is Haciendas Ganaderas del Norte del Cauca. The black-bellied whistling-duck species do not normally occur in forests. They normally occur in altitudes between 0 to 1500 meters. The artificial ecosystems and habitats of these species include agricultural lands. The natural ecosystems and habitats of these black-bellied whistling-duck species include inland wetlands, bogs, marshes, flooded grasslands, swamps, peatlands, freshwater lakes, reservoirs, lagoons and freshwater ponds. The diet of these black-bellied whistling-duck species consists mainly of seeds. Wild seeds, grass, farm cereals, aquatic vegetation and invertebrates are their primary food. These duck species are mostly nocturnal feeders. The breeding season of these black-bellied whistling-duck species is from May to August in most of their breeding range. They are monogamous and territorial. The breeding habitats include open flat grounds surrounded by trees. These ducks nest usually in tree-holes, chimneys, abandoned buildings and nest boxes. They have been observed to nest also on the ground. Both the black-bellied whistling-duck parents incubate the eggs and raise the young. The hatchlings can feed themselves immediately after hatching. They are cared for by the parents for up to two months. These black-bellied whistling-duck species are partially migratory birds. The populations occurring in the northwest Mexico and southwest USA are migratory and move southwards for wintering. The duck populations in rest of the range are resident. Post breeding, the juveniles may disperse and establish in new locations within the range. Within their range they may make local movements for feeding and breeding. The global population size of the black-bellied whistling-duck (Dendrocygna autumnalis) is estimated to be about 1,100,000 to 2,000,000 individual birds. The overall population trend of the species is considered to be increasing. In most of its range, this species is reported to be common and locally widespread. The generation length is 5.3 years. Its distribution size is about 8,760,000 sq.km. Habitat alteration, human disturbance, hunting for food and trapping for pet-trade are the main threats that are endangering the survival of this whistling-duck species. The black-bellied whistling-duck (Dendrocygna autumnalis) does not approach the thresholds for being Vulnerable, either under the range size criterion, or under the population trend criterion or under the population size criterion. The IUCN (International Union for Conservation of Nature) has categorized and evaluated the duck species and has listed it as of "Least Concern". The CITES (Convention on International Trade in Endangered Species of Wild Fauna and Flora) status is ‘Not Evaluated’ for the black-bellied whistling-duck (Dendrocygna autumnalis). D. a. autumnalis (Linnaeus, 1758). 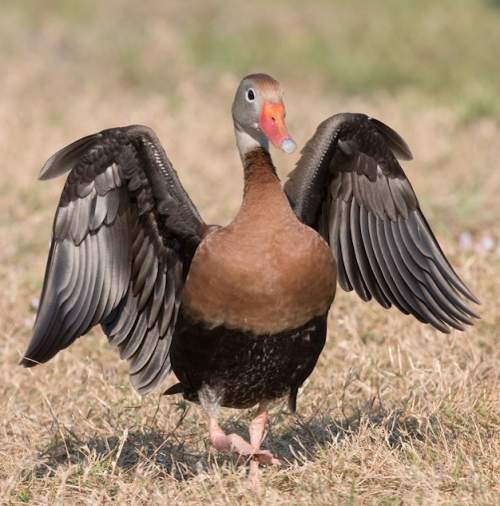 Recently updated and current topic in Bird World: Black-bellied whistling-duck - Dendrocygna autumnalis.